The Food Safety teams after keeping an eye on the suspects for a few days, finally nabbed a top brands replica manufacturing racket in Mansa, informed Mr. KS Pannu, Commissioner Food Safety and Drug Administration Punjab. The Commissioner informed that a raid was conducted around midnight by food safety team along with the police officials at a house in Mansa. The domestic premise was being used to prepare the ‘fake branded products’. The accused were caught preparing fake brands of Verka, Amul and Milkfood ghee. 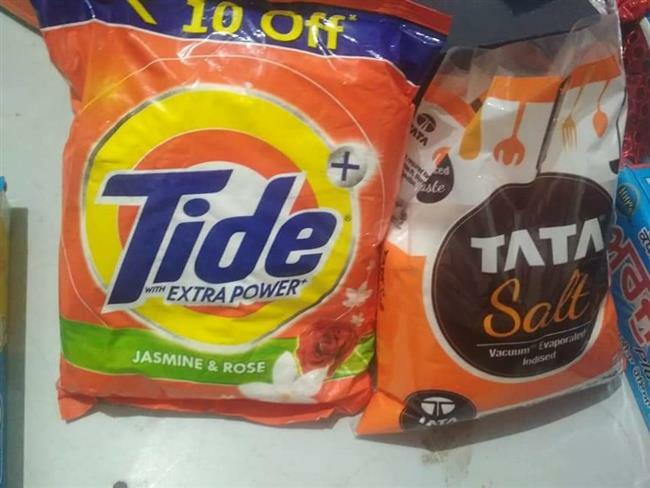 Besides, fake Tata Salt, Good Day Salt , Tide Detergent and other fake products under the label of famous brands were found on the spot. The accused made desi ghee from vegetable fat mixture and stamped and labeled the packets at their house. Five brands of vanaspati were being used alongwith three brands of desi ghee of low cost to concoct a mixture to fill in the packaging similar to top brands in the market. A crude "chulha cylinder" was installed to mix vanaspati, cooking medium and mixture of oils to make ghee . A large number of labels of various products were recovered, indicating the involvement of other people stationed at different places for preparing and selling the fake products under the garb of famous brands. About 700 printed packets of Tata Tea Gold filled with low quality tea were also found. Entire stock including wrappers and packets was seized and FIR has been registered under relevant sections against the accused. Similarly, a case of fake labeling case pertaining to mustard oil was detected in Sangrur where in a mustard oil packer by the name of Ganesh Trading Company was found labeling the rice bran oil as pure mustard oil. The owner confessed the crime. Sampling was done and the unit was sealed.